Sunflower seeds are increasingly their favorite snack, and with good reason. Sunflower seeds will satisfy your hunger and supply significant amounts of vitamin E, magnesium, and selenium, all of which are great for endurance and metabolism. Sunflower seeds are rich in phytosterols, plant chemicals that help reduce blood levels of cholesterol while supporting hormonal health. Sunflower oil is high in vitamin E and linoleic acid. It also contains oleic acid, lecithin, tocopherols, and carotenoids. Sunflower oil also appears to contribute to lowering cholesterol. (sunflower oil) One tablespoon of sunflower oil provides 124 calories, 0 g carbohydrate, 0 g protein, 14 g fat, and 0 g dietary fiber. nutritional composition (sunflower seeds) One ounce of unsalted dry roasted sunflower seed kernels provides 165 calories, 6.8 g carbohydrate, 5.5 g protein, 14.1 g fat, 3 g dietary fiber, 1.9 mg niacin, 2 mg pantothenic acid, 67 mcg folic acid, 241 mg potassium, 1 mg sodium, 327 mg phosphorus, 241 mg potassium, 20 mg calcium, 1.08 mg iron, and 37 mg magnesium. and supply significant amounts of vitamin E, magnesium, and selenium, all of which are great for endurance and metabolism. Sunflower seeds are rich in phytosterols, plant chemicals that help reduce blood levels of cholesterol while supporting hormonal health. One ounce of walnut pieces provides 190 calories, 4 g carbohydrate, 4 g protein, 19 g fat, and 1 g dietary fiber. Agave is a succulent plant, one species of which is used for making tequila. Although they are commonly referred to as cacti, agave plants are related to the lily family rather than the cactus. The sap of some agave plants is sweet enough that native Mexicans called it �honey water,� and it is now used commercially as the basis for a sweetener. The natural sap is a source of iron, calcium, potassium, and magnesium. However, the agave syrup or nectar currently marketed is heavily processed, and is therefore much more refined than the simple sap. Agave syrup is 90 percent fructose and therefore tastes very sweet, so less of it can be used to provide the same sweetening effect as table sugar. Depending on how heavily refined the agave syrup is, it may�or may not�have a better glycemic profile than refined cane sugar. 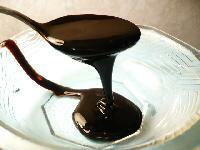 One teaspoon of agave syrup provides 15 calories, 4 g carbohydrate, 0 g protein, 0 g fat, 0 g dietary fiber, 4 g sugars. 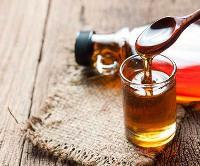 Honey�s sweetness comes from fructose and glucose, as well as other complex sugars. 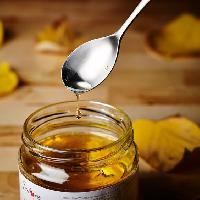 It contains very slight amounts of vitamins and minerals, but given the amounts normally consumed, honey cannot be considered a significant source of any of them. For centuries, honey has been used topically for its antibacterial and antimicrobial properties. One tablespoon of strained or extracted honey provides 64 calories, 17.3 g carbohydrate, 0.1 g protein, 0 g fat, 0.2 g dietary fiber, 11 mg potassium, and 1 mg sodium. Maple syrup is an excellent source of manganese and a good source of zinc, though the amount of maple syrup that would be consumed as a sweetener would not provide a significant amount of either nutrient. One tablespoon of maple syrup provides 52 calories, 13.4 g carbohydrate, 0 g protein, 0 g fat, 0 g dietary fiber, 41 mg potassium, 2 mg sodium, 13 mg calcium, 3 mg magnesium, and 0.83 mg zinc. Blackstrap molasses is a product of sugar-making: It is the syrup that remains after the process has extracted all the sugar that it can. Although much of the sucrose has been crystallized out into sugar, most of the calories in blackstrap molasses still come from sugar. It is also a significant source of calcium, magnesium, potassium, and iron. This mineral content is good for building strong bones, maintaining hydration, and lowering blood pressure. The iron in molasses is vital to preventing anemia and producing red blood cells, especially important if one�s diet is low in other sources of iron, such as red meat. This nutrient probably accounts for blackstrap molasses� early reputation as a health food. One tablespoon of blackstrap molasses provides 47 calories, 12.2 g carbohydrate, 0 g protein, 0 g fat, 0 g dietary fiber, 498 mg potassium, 11 mg sodium, 172 mg calcium, 8 mg phosphorus, 3.5 mg iron, and 43 mg magnesium. Chocolate chips can satisfy your chocolate cravings without going overboard�you can eat just a few instead of giving in to a whole chocolate bar. It�s a bonus that dark chocolate has been shown to provide some heart benefits�specifically, lowering blood pressure�thanks to its antioxidants and flavonoids. No wonder Valentine�s chocolates come in heart-shaped boxes! Twenty semi-sweet chocolate chips provide 50 calories, 5.5 g carbohydrate, 0 g protein, 3 g fat, 0 g dietary fiber, 20 mg calcium, and 1.08 mg iron. Vinegar is produced when alcohols converted from sugars undergo a process of fermentation. Apple cider vinegar is made from fresh apples. It contains vitamins, beta-carotene, pectin, and several minerals, including potassium, sodium, magnesium, calcium, phosphorus, and iron. Vinegar appears to help lower blood glucose levels. It contains chromium, which can help regulate insulin levels and is important in glucose metabolism. Vinegar delays gastric emptying and helps lower blood glucose and insulin levels in people who are healthy. Vinegar may contribute to lower cholesterol levels and lower blood pressure. Vinegar is also being investigated for its cancer-killing potential. As an ingredient in many types of traditional medicine for millennia, vinegar has been credited with the power to treat almost everything: constipation, arthritis, headaches, weak bones, indigestion, high cholesterol, diarrhea, eczema, sore eyes, chronic fatigue, mild food poisoning, hair loss, high blood pressure, and obesity. Vinegar is a great fat-free component in recipes and salad dressings�though be sure to include some fat in your salad dressings to help your body digest and absorb all the good nutrients in the green vegetables. One tablespoon of apple cider vinegar provides 2 calories, 0.9 g carbohydrate, 0 g protein, 0 g fat, 0 g dietary fiber, 15 mg potassium, 1 mg calcium, 1 mg phosphorus, and 0.1 mg iron. Brewer�s yeast appears to help stabilize both serum triglycerides and glucose levels, due to its high levels of chromium. If you are interested in its sugar-regulating effects, seek out the type that has not been �debittered,� because chromium is removed in the debittering process. Brewer�s yeast also provides B vitamins, and it is one of the very few non-animal sources of vitamin B12. 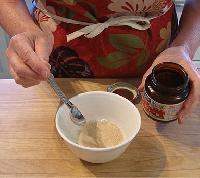 Sprinkle brewer�s yeast on food to add extra B vitamins, protein, and minerals. Many folk remedies for poor skin include brewer�s yeast, and some studies have suggested that consuming brewer�s yeast can accelerate the healing time for cuts and similar injuries. One ounce of brewer�s yeast provides 80 calories, 10.9 g carbohydrate, 11 g protein, 0.3 g fat, 1.1 g dietary fiber, 4.4 mg thiamine, 10.7 mg niacin, 1.2 mg riboflavin, 537 mg potassium, 34 mg sodium, 497 mg phosphorus, 60 mg calcium, and 4.9 mg iron. Cardamom is an exotic-tasting, sweet spice derived from the seeds of a ginger-like plant. Cardamom gives chai its spiciness and is a cuisine feature from India and the Middle East to Scandinavia. The Greeks and Romans used cardamom as a perfume. Cardamom may help with cleansing the kidneys and the bladder, stimulating the digestive system, and reducing gas. It has been shown to be antispasmodic and can counteract excess acidity in the stomach, stimulate appetite, remedy infection, and cure halitosis (bad breath). It is also credited with improving circulation to the lungs, which Benefits those with asthma and bronchitis. One teaspoon of ground cardamom provides 6 calories, 1.4 g carbohydrate, 0.2 g protein, 0.1 g fat, 0.6 g dietary fiber, 22 mg potassium, 4 mg phosphorus, 8 mg calcium, 0.28 mg iron, 5 mg magnesium, 0.01 mg copper, 0.15 mg zinc, and 0.56 mg manganese. 09. How were the mountains formed?